Leighton-Denny Dramatic Nail Polish - "Drama Queen"
Products Accessories Nail Tools Leighton-Denny Dramatic Nail Polish - "Drama Queen"
DRAMA QUEEN is the perfect way to unleash your inner diva, a show-stopping blue/purple that demands attention and puts you in the spotlight. Ensure nail tips are smooth and even and the nails are clean, dryandfree from any oily residue. Apply a base coat to the nail and allowtodry. The Leighton Denny base coat, UNDERCOVER, dries matt tohelpgrip nail colour and tell you that it is time to apply the nailcolour.Roll the colour bottle between the hands to mix it up; nevershake itas this can cause air bubbles. Apply two thin coats overthe basecoat rather than one thick coat. This helps reduce chipping andextendwear time. Wipe one side of the brush on the neck of the bottle soitholds just enough to cover one nail. Present the brush to the nailabout2 mm away from the cuticle then push the brush towards thecuticlebefore making the usual sweep back towards the tip. Ideally,finishwith CRYSTAL FINISH topcoat to help seal the colour and againextendwear time. Tidy any mistakes with the PRECISION CORRECTOR LIQUID.Dip thebrush into the bottle then use the brush like an eraser toremove andtidy. For the fastest finish, drip a little MIRACLE DROPS over the polish to speed up drying time. 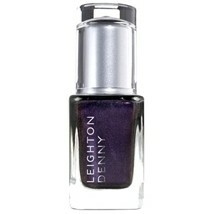 Watched Leighton-Denny on QVC and loved all his colours, was luck enough to get this and a few others as Xmas gifts. Drama Queen is exactly what this polish is...its Drama on your nails. Its a fabulous colour, one i normally wouldnt wear, but this one is so gorgeous on that it works. The almost purple/black is so dramatic it's just drama with style. "Stunning colour and fabulous looking"